Welcome to our latest project at Winchcombe.We are constructing the show arena of this new build, it consists of 3 show home gardens, front and rear and the car parking area. We are working on a three week time-scale to complete the entire project. The images above show some of the house fronts before work begins on the gardens. Our first task is to mark everything out according to the plans. We could then begin to construct the various structures. We had decks to build patios to lay, pergolas to construct and paths to lay! We laid many metres of weed suppressing fabric and took delivery of tons of both gravel and topsoil. 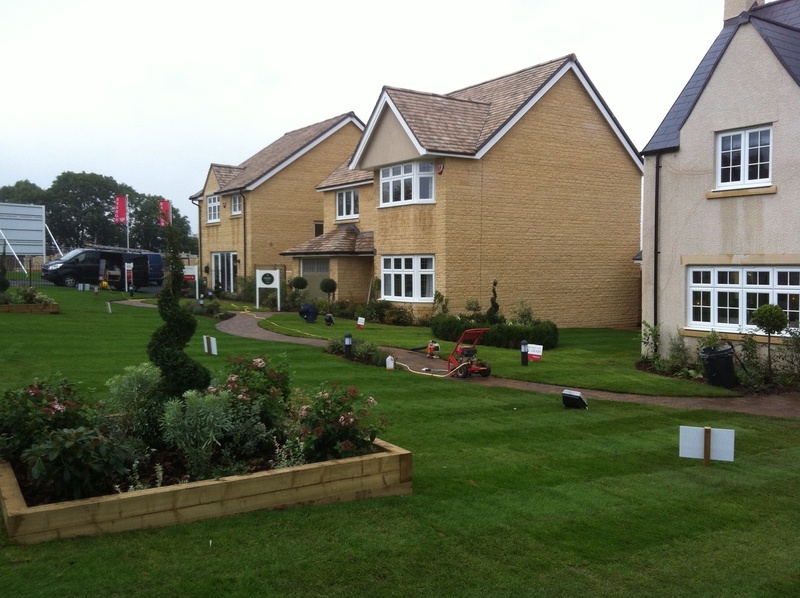 There was thousands of square metres of turf, thousands of plants and various cobbles and decorative stones. We spread, we levelled, we laid, we constructed and we planted. Then with a few finishing touches, three weeks down the line voilà! Job done and very nice too. Above are some pictures of some of the front gardens. Above and below are some images of some of the rear gardens and some of the many features incorporated within them. The pictures below are of the car parking area and some of the public open spaces on the site. Another successful project completed on time and within budget.